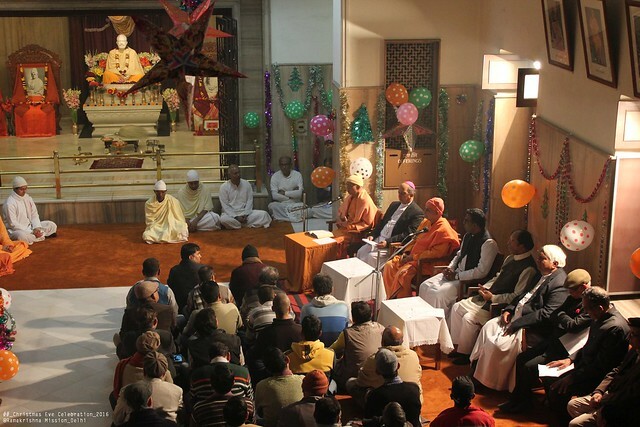 The Ramakrishna Mission, New Delhi, celebrated Christmas Eve in the Temple on Saturday, 24th December 2016 in a solemn and befitting manner. 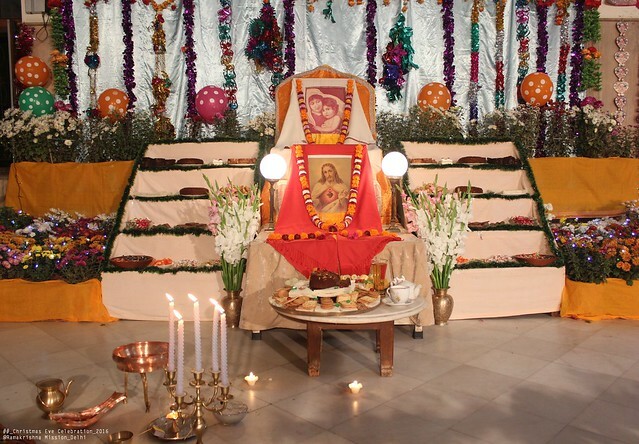 On this day, the Temple was decorated nicely and photos of Baby Jesus Christ and also Lord Jesus were adorned with garlands and flowers, and offerings were kept on the left side of the Temple hall, as it was considered to be a very special day for the Ramakrishna Mission. On this happy occasion, as usual, all prominent Christian Fathers – Archbishop Rev. Fr. 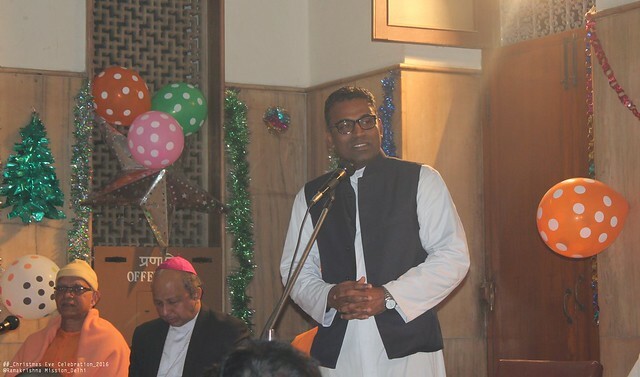 Anil Joseph Thomas Coute, Rev. Dr. M.D. Thomas and Rev. Fr. 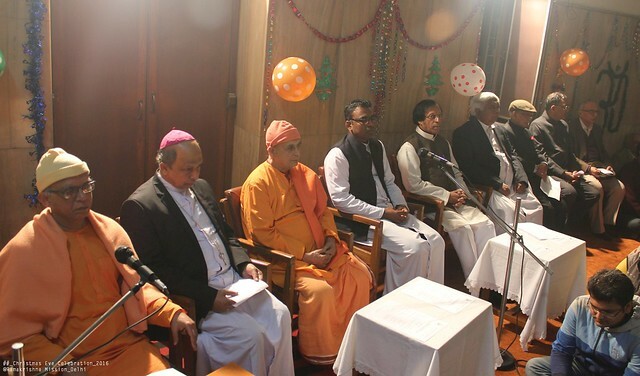 Savarimuthu Sankar, PRO, Delhi Archdiocese participated in this function. 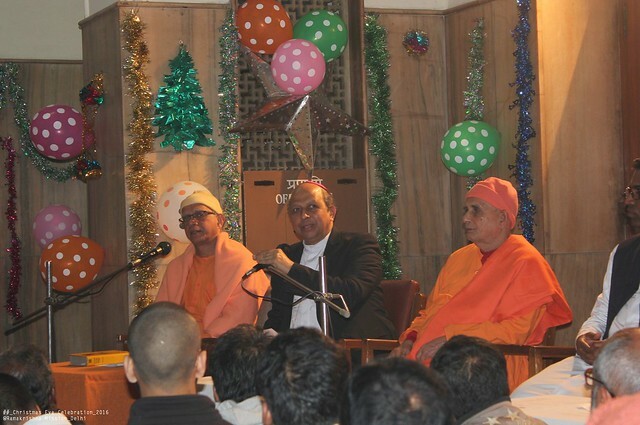 Revered Swami Jyotirupanandaji Maharaj from our Moscow centre also participated in the Christmas Eve function . This time Rev. Fr. Sebastian accompanied Rev. Archbishop. 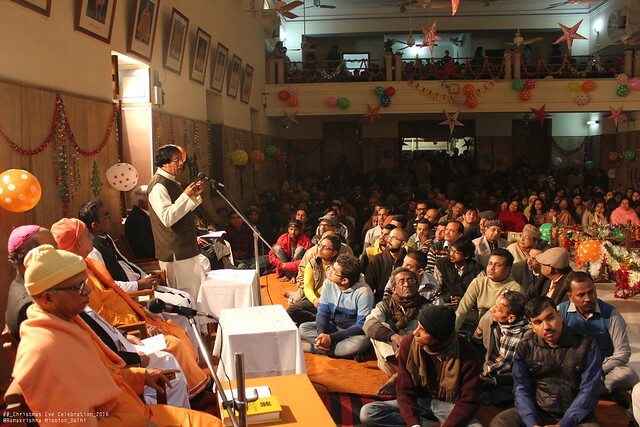 So, a minute-to-minute programme was drawn up and was distributed to all the above personalities. 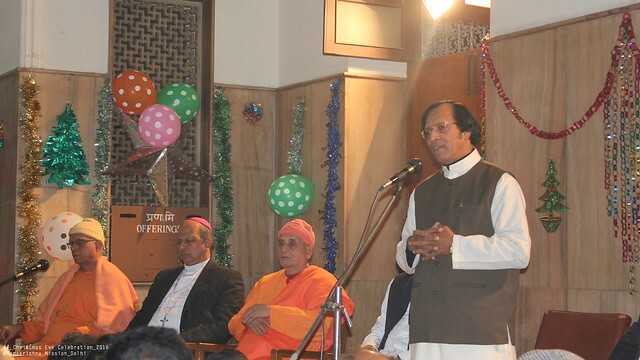 Revered Swami Shantatmanandaji Maharaj extended a warm welcome to all those assembled in the Temple on that occasion and briefly talked about the significance of celebrating Christmas Eve in all Ramakrishna Missions the world over. He also read a few passages from “The New Testament”. 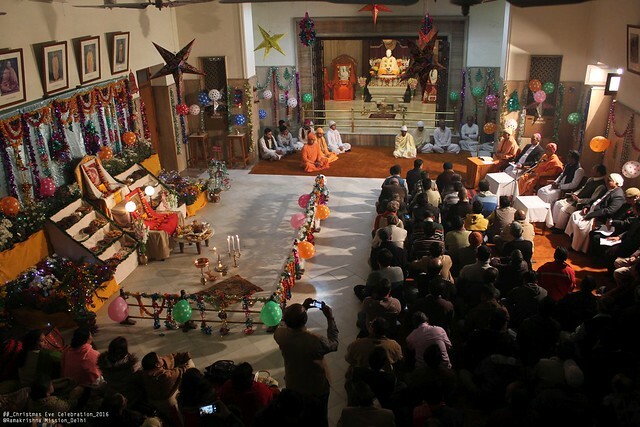 This was followed by Rev. Fr. 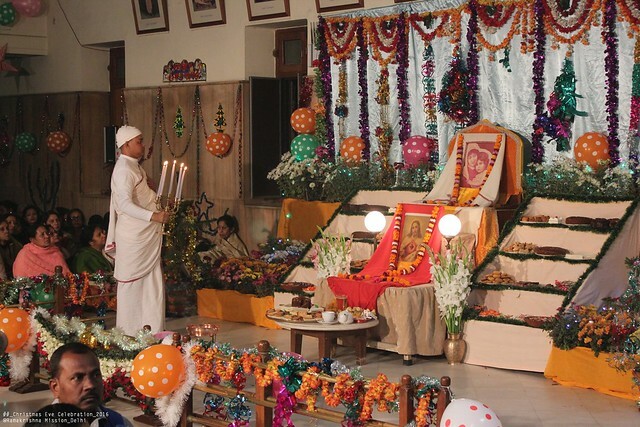 Savarimuthu Shankar and Revered Swami Jyotirupanandaji. Then Archbishop Rev. Fr. 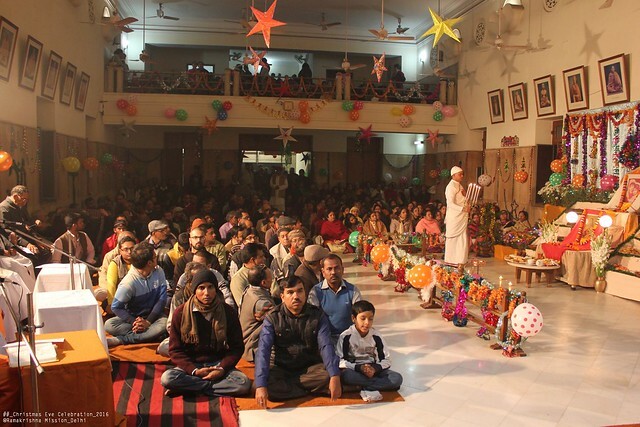 Anil Joseph Thomas Coute spoke about the message of peace of Jesus Christ and also the significance of “silent night” as was played just then. 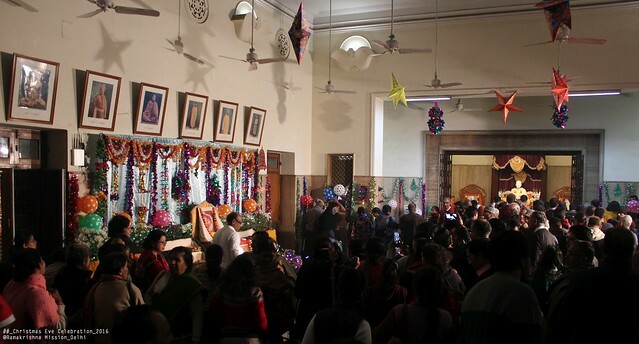 After Archbishop’s discouse on Christmas, Christmas carols – “We wish you a Mery Christmas”, “Silent Night” and “Mark the Herald” – were played again. At the end Rev. 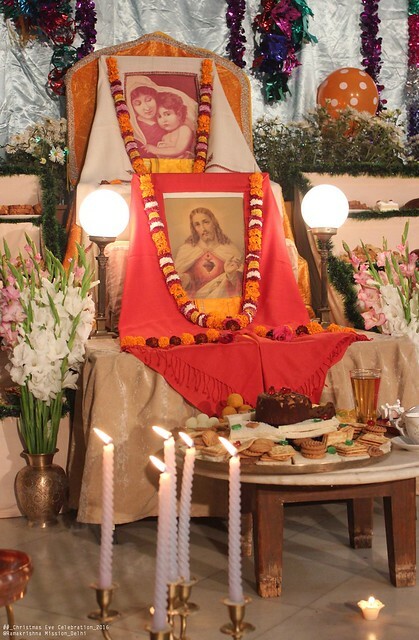 Dr. Thomas talked about various aspects of the Message of Jesus and also about Sri Ramakrishna Paramhansa..
Before their leaving, all Reverend Fathers were given sweet Prasad packets. 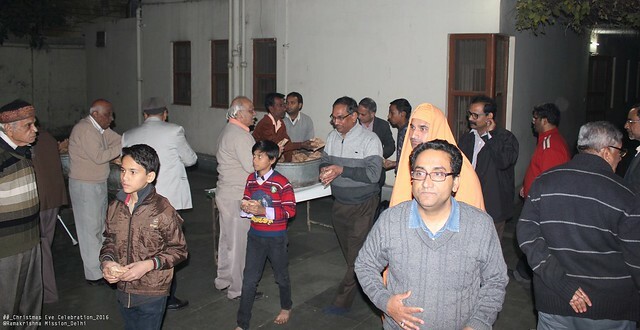 After they left, all devotees (about 700 in number) were served Prasad in packets each containing a cake piece, biscuits and toffees in each packet and also coffee and tea.